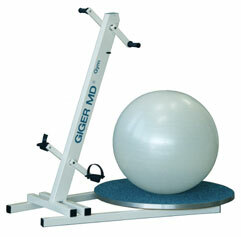 The GIGER MD® Combofit is a therapeutic tool for GIGER MD® therapy. Read on to learn more about its characteristics. GIGER MD® Combofit is suitable for every patient and easy to use. The training is painless and fatigueless and is characterized by a pleasant feeling of absolute safety. Regular repetitions can result in marked improvements even in case of severe neurological injury and disease. With the aid of the special GIGER MD® therapy software and an LED display with a computer connection, the patient is aware of his training history, current status and progress (Combofit is delivered without this software). Learn more about training with the GIGER MD® Combofit here or sign up for a free trial therapy session!